Mary Elizabeth Growden(nee Seip) - of Wiarton, passed peacefully at Victoria Hospital, London, on January 22nd, 2015 at the age of 74 years. Cherished mother of David (Cathy Byberg) of Durham, Debra of Wiarton, Tracey (Rob Hoag) of Conestogo, and Mathew (Mary-Lynn Sinclair) of Toronto. Proud grandmother of Amanda, James, Serena, Dustin and Nathan. Survived by her brother Earl Seip and his wife Marlene. Predeceased by her parents Nelda and Telford Seip; and brother Ralph Seip. 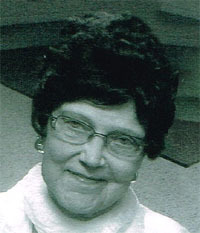 Mary was an active member of the Wiarton Community Choir, St. Peter's Lutheran Church and the Wiarton Lutheran Women. She will be remembered for her tireless efforts towards the Wiarton Bone China Tea, and her participation in the Terry Fox Walk for many years. Friends are invited to a casual Come and Go Memorial at St. Peter's Lutheran Church (441 Brown St., Wiarton) on Wednesday January 28, 2015 from 1-3:30 pm. A service to celebrate Mary's life will be conducted at the church at 3:30pm. Cremation has taken place. Mary enjoyed an extra 20 years of life due to her double lung transplant in 1994. Please consider being an organ donor so that you might also give the gift of health and/or life to someone who needs it (www.giftoflife.on.ca). Donations to the Trillium Gift of Life Network, BPHS Foundation, or a charity of your choice, would be appreciated. Funeral arrangements completed from the Thomas C. Whitcroft Peninsula Chapel, 272 Berford St., Wiarton, (519) 534-5341.